On February 8, 2011, with no debate, PA Rep. Bryan Cutler’s new PA lobbying penalties bill (HB 103) sailed through the PA House of Representatives by an overwhelming majority (197-0). (5) (in addition to the other penalties) bar a lobbyist from lobbying for economic consideration for up to 10 years instead of the current 5 years. This bill was designed to provide the Pennsylvania Department of State with a stronger enforcement tool, and hopefully prevent another “Lions Gate-McCombs” incident (see analysis below). Lawmakers felt that for larger lobbying entities, the current penalty scheme was too low to be an effective deterrent. The PA Department of State is staffed with many decent and competent civil servants. Since 2007 when the State’s lobbying law took effect, the Department has made every effort to work with the regulated community and even work with smaller organizations to help them become compliant. Unfortunately, vague laws that grant broad discretion to regulatory agencies create confusion through inconsistent application of standards and can even invite abuse. If enacted, Rep. Cutler’s lobbying penalties bill would create an obstacle to public participation in advocacy that is fundamentally contrary to the public interest. HB 103 would have a chilling effect on grassroots advocacy for individuals, smaller organizations and small businesses in Pennsylvania. The unintended consequences of this bill– presuming that they are unintended– are severe. Who would be willing to exercise their Constitutional right to engage in advocacy if penalties for a mistake could cost them so dearly? The lobbying registration and disclosure threshold is so low (at $2,500 per calendar quarter) and so broad (in what must be disclosed) that people may be violating the law by not registering, and they might not even know it. The law is so complex and so burdensome in its communications tracking and document retention obligations, that making a simple mistake is easy. The PA Department of State is typically so understaffed and underfunded that it could take weeks (or longer) before that mistake is even discovered. If HB 103 is enacted in its present form, a simple mistake could carry terrible consequences for the individual and his/her organization. If you work with nonprofit, and this bill become law, good luck building coalitions. Good luck getting your members or your client’s members involved in public policy. Good luck encouraging organizations to take action… more than once. In other words, good luck helping others exercise their first amendment rights in Pennsylvania. 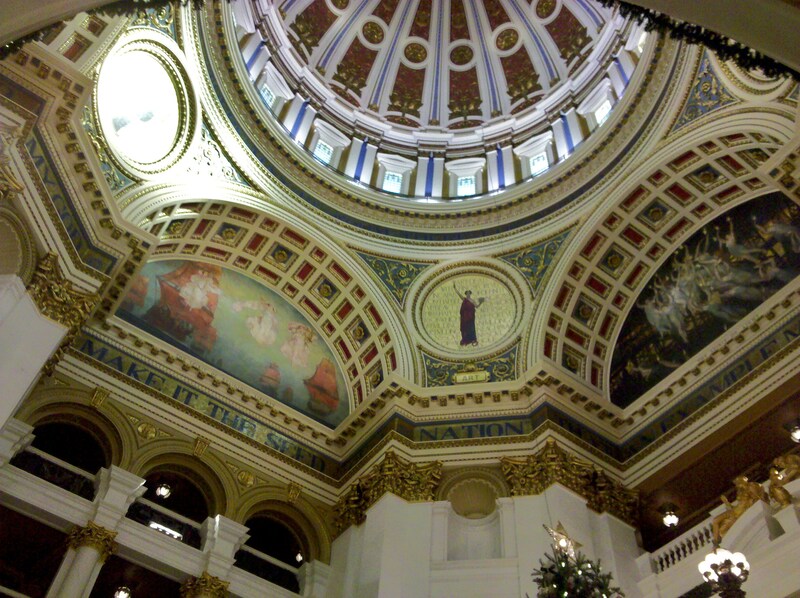 The bill passed in the PA House of Representatives on February 8, 2011, by a vote of 197-0. There was no dissent. The next day, Feb. 9, 2011, the bill was sent to the State Senate where it was referred to the Senate State Government Committee for further consideration. This same bill was introduced in two prior legislative sessions, but died in Committee. This time around, Cutler’s penalties bill has found new support as part of a package of reform bills fast-tracked by the State House and Senate majority leadership. To his credit, Rep. Bryan Cutler (R-Lancaster) is aware of these concerns. He has offered to work with the Pennsylvania Association of Government Relations Professionals (PAGR) to tighten-up language in the underlying law, and with Common Cause of Pennsylvania to find a solution for the chilling effect– if one is possible. It’s still unclear whether any effort to fix this bill might open the floodgates for efforts to change he underlying law– for better or for worse. HB 103 must be amended or killed in the PA Senate State Government Committee. It can not be allowed to move forward in its current form. Direct inquiries to David A. Ross J.D. at daross001@gmail.com. During the third calendar quarter of 2007, A former Pittsburgh TV anchor and Rendell fundraiser, Leslie McCombs, failed to register as a lobbyist under Pennsylvania’s Lobbying Registration and Disclosure Law while she was lobbying on behalf of Lions Gate Entertainment Corp, a California film production company. The bill being lobbied provided for a $75 million film maker tax credit. McCombs said that said she didn’t think she needed to register for Lions Gate because she was already registered as a lobbyist for the University of Pittsburgh Medical Center (UPMC). She said that UPMC cleared her to work on the film tax issue as a one-time deal (whatever that meant). Lions Gate hired the lobbying firm of former House Minority Whip Mike Veon as its main lobbyist with (I’m told) a $750,000 retainer. Veon Kopp & Associates employed Colleen Kopp, a former deputy secretary of legislative affairs for Rendell. Dawn Keezer, head of the Pittsburgh Film Office, said McCombs “helped use her connections to help get the film legislation passed”, because they claim, there was no Pittsburgh film industry without the tax credit. Veon Kopp & Associates listed Lions Gate as a client, but McCombs did not amend her lobbyist registration to add Lions gate as her client. McCombs remained “unregistered” as to Lions Gate the entire time she lobbied the bill (June through September of 2007). Eventually Lions Gate and McCombs amended their registration statements. There was some disagreement however, about the duration that they were “out of compliance”. By July of 2009, the State Ethics Commission fined McCombs $5,025 for failing to promptly register as a lobbyist for Lions Gate Entertainment Corp. and omitting a daytime phone number in registering as a lobbyist for UPMC. The many reasons behind this sordid affair involve everything from allegations of sexual indiscretion to state tax credits underwriting ¼ of the film costs so the UPMC logo would appear in a national television series. (which is basically corporate welfare) McCombs’ fine was based on $50 for each day she worked as a lobbyist for Lions Gate. McCombs paid the fine, but it was more embarrassing for the PA Department of State than it was for McCombs. For McCombs, or for Lions Gate, the fine was so cheap relative to the gain that the Department of State was nearly powerless to enforce it’s new Lobbying Law. Read Lobbyist cites ‘oversight’ in registration snafu, By Brad Bumsted, Pittsburgh Tribune-Review (9/5/07), and UMPC fouls another one off, from the Health Care Renewal Blog, by Roy M. Poses M.D. (9/17/09) which is commentary on the article State Ethics Commission fines UPMC’s Leslie McCombs, by Kris Mamula, Pittsburgh Business Times (9/10/09). The old legal maxim that hard cases make for bad law is appropriate here. Particularly unpleasant cases are a poor basis for a general law which would cover a wider range of less extreme cases. Compare the McCombs -Lions Gate case with the recent Scarnati-Console Energy case. On February 14, 2011, Senate President Pro Tempore, Joe Scarnati (R., Jefferson) agreed to repay from his personal account, the value of the Super Bowl tickets that he had accepted as a gift from Console Energy, a company with large Natural Gas interests in Pennsylvania. Scarnati stated however, that he would repay the airfare from his campaign account because they discussed campaign matters on the flight. The Scarnati case underscores the need for a total gift-ban for lawmakers and for campaign finance reform. Stiffer lobbying penalties would not be applicable here, because this ethical digression is perfectly legal in Pennsylvania. Read more on the Scarnati story at: Scarnati to pay back shale company for Super Bowl junket, By Angela Couloumbis, The Philadelphia Inquirer (2/14/11), and read: Perks from Pa. drilling interests: A top senator got a free Super Bowl trip from one Marcellus Shale firm. The state permits such gifts, By Angela Couloumbis, Joseph Tanfani, and Andrew Maykuth, The Philadelphia Inquirer (2/13/11). Read the press release from State Rep. Frank Dermody, PA House Democratic Leader, detailing what House Democrats call their renewed commitment to good government, which was issued on January 17, 2011 (the day before Governor Corbett’s inaugural). Two weeks later, on January 31, 2011, the PA House Republican Caucus issued their government reform agenda known as the Pennsylvania Agenda for Trust in Harrisburg (PATH). In response, (and on that same day, January 31, 2011) the PA House Democratic Caucus issued an expanded list of “good government” bills and amendments to other bills, “upping the ante” to some extent. In recent years, “lobbying” has become a dirty word. But what about “lobbying in the public interest”, or “grassroots participation”? No matter what you call it, it’s advocacy, and it’s core to a charity’s ability to achieve its mission. To put it another way, if a charity is not lobbying, then it’s not doing its job. And not advocating “not doing their job” is exactly what would happen if the penalties under HB 103 were in effect. Compared to corporate lobbying, charity lobbying operates at a competitive disadvantage. Federal law limits the amount charities can spend on lobbying, and strictly prohibits charities from engaging in partisan electioneering. Under section 501(c)(3) of the tax code, charities can not endorse candidates, can not contribute to campaigns, and can not have political action committees (PAC’s). Since the recent Citizens United US Supreme Court decision however, corporations are much less restricted than they have been in the past, which gives corporations an overwhelming influence advantage over charities. This is supposed to be balanced by the fact that charities can receive public contributions that are income tax deductible by the donor, and (in PA and other states) charities can qualify for local property tax exemptions. In exchange for property tax exemptions, PA law requires charities to advance a charitable purpose, to donate a substantial portion of their services to benefit the community; to benefit a substantial and indefinite class of persons who are legitimate subjects of charity; to relieve government of some of its burden; and to operate entirely free from private profit motive. These points called the “5 HUP criteria” which is based on a 1980’s court case [See PA Act 55 of 1997]. By contrast, for-profit businesses have no affirmative duty to benefit their community, or to reinvest their surplus. Pennsylvania is home to over 58,000 charitable nonprofit organizations. From hospitals and colleges, to homeless shelters and museums, 501(c)(3) nonprofits employ one out of every nine workers in Pennsylvania (est. 650,000 employees) and touch the lives of nearly every person in our Commonwealth. However, the vast majority of Pennsylvania’s public charities are small. Over 90% have annual operating budgets of under $500,000. Together, these 90% hold only 5.6% of the nonprofit sector’s total assets, and generate just over 2% of the sector’s total revenue. These smaller charities are barely able to understand Pennsylvania’s vague, complex and burdensome lobbying registration and disclosure law, let alone to correctly comply with it. Furthermore, smaller charities, small businesses and individual lobbyists can not absorb violations of $250 per day for a simple mistake, or a $100,000 misdemeanor for something more complicated. They would more likely disengage from public policy entirely, or choose to violate by not registering. Never the less, organizations receive no special treatment or exemptions under the PA Lobbying Law. Instead, the law was specifically designed to put charities’ lobbying on record. Charities, small businesses and citizen activists are an irreplaceable resource to lawmakers for research and policy, and they are a valued partner in the legislative process. Mission driven institutions operate on the frontlines of society’s problems, serve under-represented groups, and service state and local government contracts. Only by working together with all of these groups, can lawmakers truly improve the quality of life in our communities. If penalties for simply sharing information are too high, then legislators and regulators will soon be working in a vacuum, without the benefit of the regulated community’s experience. The American Jobs and Closing Tax Loopholes Act of 2010 (H.R.4213) passed the U.S. Senate yesterday (Tuesday, 7/20/10) by a vote of 60-40 just enough to overcome the Republican filibuster threat extending unemployment benefits for 2.5 million jobless Americans. The bill now goes back to the House for approval before it can be sent to the President for approval. The cost of the bill is estimated at $34 billion, less than half of the original $200 billion price tag, and as much as 70% being paid with offsets. While the bill has many provisions to close tax loopholes affecting wealthy individuals and corporations, the bill extends for three month the closing deadline for first-time homebuyers looking to get the $8,000 tax credit, and also extends charitable tax incentives we lobbied for under the Pension Protection Act of 2006, such as the IRA rollover (sec.226) and the enhanced charitable deductions for contributions of food (sec.251), books (sec.252) or computers (sec.253). H.R.4213.EAH would extend benefits for the next three months (until November) retroactive to the first week of June. What’s missing? The $25 per week Federal Additional Compensation (FAC) stimulus is missing, as is an extension of COBRA health insurance. It also includes drastic reductions in Medicaid, Medicare, and Tricare. All of this of course impact families that are already struggling to find gainful employment. American families are facing a crisis not witnessed in decades, joblessness, homelessness, lack of medical care, and even hunger. In Philadelphia at least, one third of those going hungry are children. Extension of unemployment benefits is a critical step, but it is only the first step. This would be the eighth extension of unemployment benefits since July 2008, at a total cost of over $120 billion. WHERE IS THE PLAN TO FIX THE ECONOMY? Where is the plan to work with business and nonprofits to grow the workforce with well-paying jobs upon which a person can build a family?